And add to it Trader Joe's Butter Toffee Pretzels. That's my "do not buy" list. Not because I don't like them...it's quite the opposite problem. It's that I like them too much and I feel like I have no choice but to inhale them if given the chance. My goodness. These are irresistible little buggers for sure. Pretzels are already pretty high on my list, particularly if paired with a little cheese...but these are something else altogether. Maybe it's the crunchiness of the pretzel (solid) mixed with the crispiness of the butter toffee shell that's semi-caked on. Maybe it's the irresistable combo of butter and sugar...seriously, that glaze is full of amaze. It's rich and sugary without going too far, and when hit with a hefty dose of salt from the pretzel...man, it's like heaven. I love it. 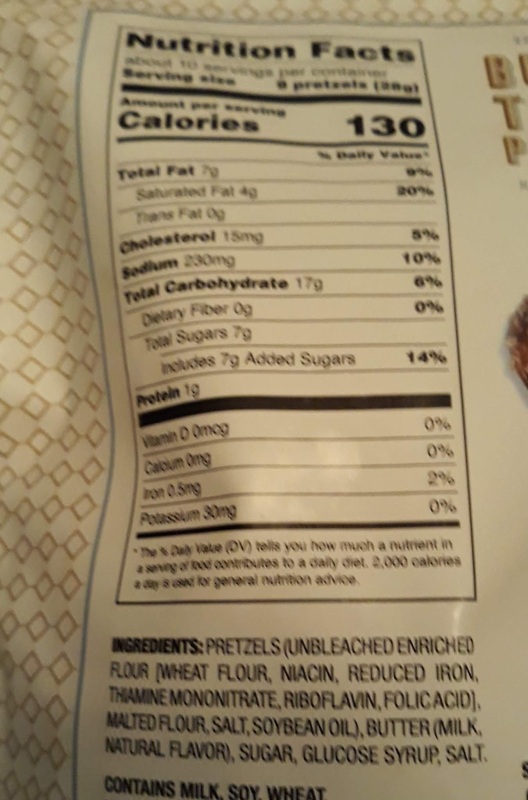 The inherent grainy goodness of the pretzel base ties it all together...I could eat the whole bag and have only a small dose of guilt. That'd probably be made up for with a new cavity and/or the diabeetus. Poor Sandy. We picked up a bag last week before she ran the Philly marathon. For the record, she kicked it's bunnytail, and all she wanted afterwards was a couple more of these pretzels ...except I'd already destroyed them. Negative husband points were earned that day. 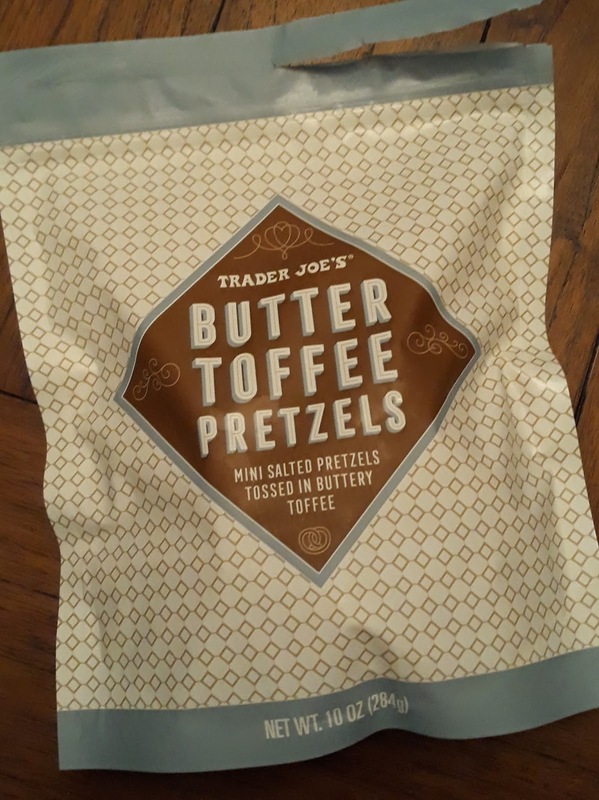 Even now, she got another bag, and I promised her I'd sneak only one or two before writing this review to "remind myself of the taste." I omitted the word "handfuls" though. And I promised her she could have the rest...maybe I'll just have to get my own. Awesome little snack for sure. Absolutely addictive, so consume with care. I'm not 100% sure of the cost, but whatever, it's worth it. 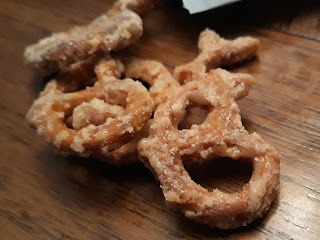 These toffee pretzels are good enough to be holiday tin-worthy in my opinion, provided you'd actually want to share them. Not that I'll get them again....no, really I shouldn't....mustn't....Russell, behave....I think I've made my opinion clear. Good enough for at least a 4.5 in my book. 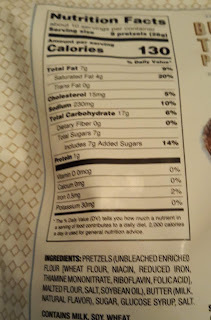 Sandy's not as in love with the pretzels as I am, but still gives them a solid 4. I really should not have read this review. Have you tried the peppermint meringues yet? IT SO DANGEROUSLY GOOD! Very light & minty. I need to try these and I hope TJ's will keep these on shelves even after holiday season is over. What the what?!??? Sandy ran the marathon???! Whoah! Congratulations to your bad-a$$ wife! Very impressive. And i am entirely positive i will love these- only trader joes in nyc on the weekend this time of year is a special kind of intensity (I can’t get there during the week). I have a similar list of can’t buy unless i am proceeding directly to a group situation and will have to share! Just picked some up today. Pretty yummy! I got some and mixed them with the spiced pecans - perfect mix of sweet, salty and spicy. A few days later, stopped for more to take home for Christmas and was told they were out and would get no more - seasonal. Bummer - these should be available year round.